In this blog post, I'm going to go over the new policy sets in ISE 2.3. A lot of people have come to me and thought they would need to re-learn ISE for the new policy sets. Well, I have good news for you: While there are some enhancements, it's not really as initimating or new as you think. Are there enhancements? Sure! But much of what you know of policy sets are still the same. Yes, you can QUICKLY add your attributes without having to go through tons of nested attributes slowly. This is a GOOD thing. It's not changing the nature of ISE or how to add the attributes, it's just making it EASIER and faster to get done. 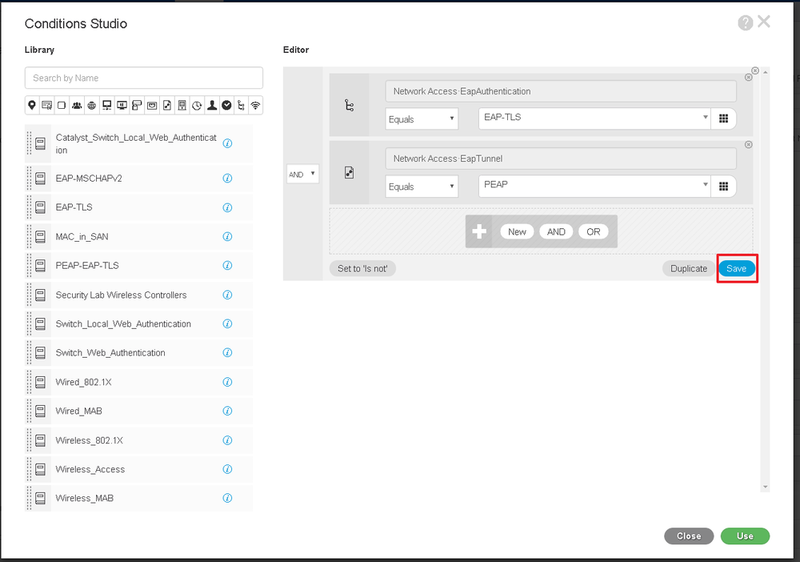 Other enhancements to the rules and conditions is the ability to do multiple logical AND and OR statements such as below where am looking for the conditions of PEAP-EAP-TLS being used AND it's either coming from WLAN ID #1 OR WLAN ID #5. This makes it easier to trim down some rules and policy sets. Another option in the policy sets is the ability to set a "Is NOT" qualifier if you choose to do so. Again, this is in hopes of reducing duplicate rules so you don't have to create a rule for every different option. You can choose to continue doing policy sets and conditions the same old way as before. As I hope I've conveyed above, it's the same expect how it's laid out but there are some more easy options to enhance and trim down your rules a bit more. Hopefully you've found this blog post enjoyable and this has cleared up some of the misconceptions of the new policy sets. The end result is that you can continue to make conditions and policies as you used to if you want to change nothing at all - That's completely fine! If anything, the ISE makers just made it a bit faster to make those policies by getting rid of the nested conditions. But if you find yourself needing to create some more complex conditions, you now know your options. Newer PostISE 2.3 - What's New?